The National World War I Museum and Memorial in Kansas City. This year marks the 100th anniversary of the U.S. declaration of war on Germany and subsequent participation in World War I. 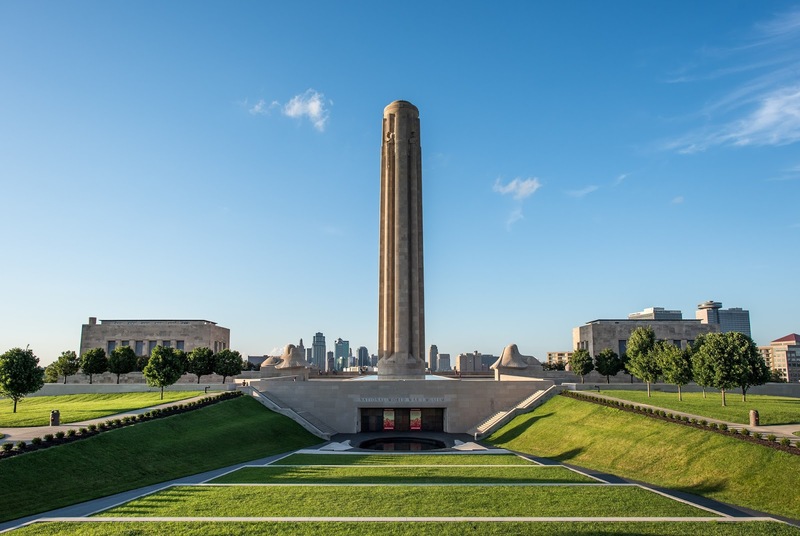 To commemorate the centennial, the Kansas City World War I Museum, with one of the largest collections of WWI artifacts in the world, will show special exhibits and presentations throughout the year. When walking toward the entrance, we crossed the glass floor with a field of poppies below us, which reminded us of the lines: "In Flanders fields the poppies blow between the crosses, row on row", from the poem "In Flanders Fields," which suggests the horrendous loss of life - more than 17 million - during the war. An introductory movie described the accident that began the war. The Austrian Archduke Franz Ferdinand, while visiting Sarajevo in Bosnia, was shot when his car took a wrong turn, putting him right in front of the spot where an assassin was standing. Both Ferdinand and his wife were shot, and a Browning .38-caliber short, similar to the murder weapon, is at the entrance to the museums' displays. At that time, Germany feared the power of France because of the devastation Napoleon had wrought in Europe. Powerful rulers, although often related through the offspring of Britain’s Queen Victoria, mistrusted each other. Nervous about other countries’ intentions, rulers formed alliances and agreed that if one went to war, the others also would enter the fray. Germany paired with the powerful Austria-Hungary empire and Russia with Serbia. France had an alliance with Russia and Britain with France. The conflict became known as World War I only after the start of World War II. Before then, it was known simply as the Great War. The East Gallery focuses on the history and weapons from the start of the war in 1914 to our entry in 1917. The West Gallery tells the story of the war from 1917 to its end in 1919 with heavy emphasis on the U.S. participation. In the first section, the rifles of each of the armies helped us understand the sheer number involved from around the world. Propaganda posters line the upper wall demonstrating how the troops were shown the importance of their participation. We were especially impressed with the models of trenches used on the European Western front where so many soldiers died. The Germans had well-built trenches that paid attention to the comfort of the troops by keeping their feet out of the water and providing better sleeping conditions. When we looked into a British trench, we could see trash and debris building up. French trenches were the worst - poorly built, often collapsing and generally getting so bad it was one of the reasons the troops mutinied. New weapons were being introduced to the troops, and one of the problems was that the major officers directing the battles did not take the modern weapons' efficiency into account. Troops were marched directly into machine gun fire that decimated them. The war eventually became trench warfare. By 1917, along the 460-mile Western Front, troops had dug 35,000 miles of trenches. Besides the deadly machine gun, new weapons included poison gas, fast-firing heavy artillery and, as the war progressed, airplanes and tanks. German submarines and their torpedoes sank ships at a heavy rate - their sinking of American ships is one of the reasons we entered the war. Battleships became major players in the sea war. The most impressive display resides halfway through the museum. We stood at a railing overlooking no-man's land with four mannequin soldiers, who were trying to avoid the mud and wreckage. In front of us was a 110-foot-by-20-foot screen. Abruptly, black-and-white moving pictures from the war appeared: original films from the period that showed trench warfare and the war at sea that eventually brought the United States into the war when Germany started sinking ships carrying supplies to the Allies. One of the defining events of our entry was the Germans attempting to get Mexico to start a war with the United States to keep us out of the war in Europe. The opening displays to the Western Gallery introduced us to the participation of women in the war as factory workers, guards, firefighters, and heavy machine operators. One section is devoted to the 25,000 American women who provided support to the troops in Europe. About 13,000 were in the Army or Marines, where they served as clerical help, while most of the others served as nurses. Their roles in the war helped advance women’s right to vote. While the East Gallery has a good collection of artillery weapons, the West Gallery is where we saw our first tank and truck along with a team of horses pulling weapons. 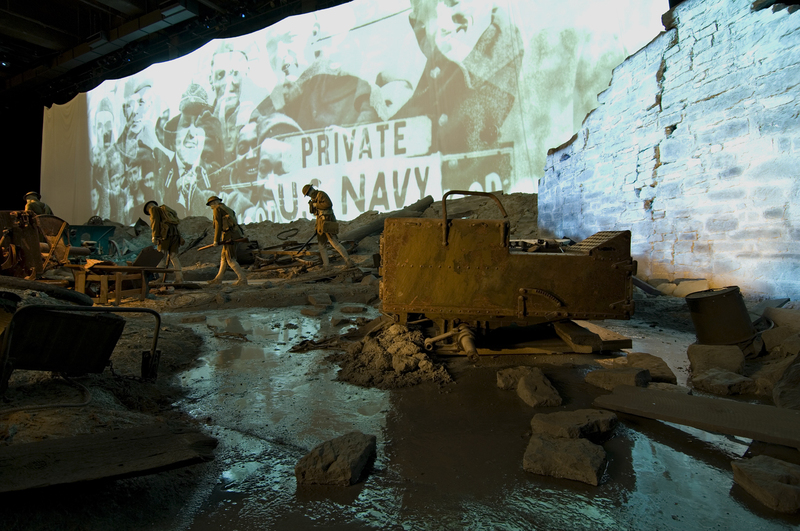 Throughout the museum are small screen films of what was going on at home during the war, statistics about the number of deaths and what was happening in other parts of the world. Every attempt is made to make this a learning experience for the visitor, with special attention paid to children with the use of a family gallery guide where children can do scavenger hunts for items or find answers to questions such as, "Which four states sent the most soldiers from America 'Over There?' "
At the end of tour we were informed of the failures of the treaty at Versailles and the redrawing of the world map that resulted from the war. While no one seemed to have anticipated that this war would set the stage for the start of a war 20 years later, the final exhibit notes that three of the most powerful leaders came out of this war with attitudes that would lead to World War II: Adolf Hitler, Benito Mussolini and Joseph Stalin. On the Allies' side, future leaders involved were Winston Churchill, Franklin Roosevelt, Dwight Eisenhower and an artillery captain from Missouri, Harry Truman. Atop the WWI Museum stand three structures: a high tower visitors can ride to the top to view Kansas City, a Memory Hall and an Exhibit Hall used for special and temporary exhibits. On our last visit in January, the Exhibit Hall had "They Shall Not Pass, 1916," the story of the death, destruction and the staggering number of unnecessary losses in the battles of the Somme and Verdun.